1. Do you know when the Cowboy Bebop Movie will be released in the US? 2. Can you send me an realaudio/mp3 file of __(insert Bebop song name here)___ ? 3. What is the name of the song that plays when Spike falls out the cathedral window in Episode #5? That song is called "Green Bird" and it is on No Disc, Cowboy Bebop OST2. 4. What is the name of the song that plays during the ending of Jupiter Jazz part 2? That song is called "Space Lion" and it is on the first Cowboy Bebop soundtrack. 5. Did you know that Tokyopop has the rights to the Cowboy Bebop manga? 6. Where can I buy the Cowboy Bebop Soundtracks? 7. What is the name of the last song played in the last episode (Real Folk Blues part 2)? That lovely song is called "Blue" and it is the first track on Bebop soundtrack #3, also titled "Blue". The song is sung by Mai Yamane. It's one of my favorite songs! 8. I just watched Real Folk Blues Pt. 1 and 2. I can't believe the ending! IS that it? Is there any more Bebop? 9. Hey! Why can't we listen to the music files here anymore???????? 10. I have been downloading all of the Bebop episodes, but I can't find episode ___. Can you send it to me? Uh, no. I am really against the downloading of commercial anime in the first place. Bebop is available on DVD. Go buy it, it's worth it. If you really love a show, go support the creators of it. Then perhaps they will make more. Oh, and make sure you buy the legitimate releases. How can they know if there is enough interest in a series to make more of it if no one buys the stuff? Supporting bootleggers only hurts the industry. So no, I will not send you any episodes, sorry. 11. What is the name of that song played during in the laboratory flashback scene during the episode 'Pierot le Fou' when they talk about Pierot's past? If I remember correctly, the song is called "On the Run" and it is not on any of the normal Bebop soundtracks, it can only be found in the Bebop CD Box Set. 12. Why don't you have an image gallery? You need more pictures! Well, I had originally intended to put up some sort of image gallery on this site, but it eventually seemed sort of pointless after the series suddenly became so popular and everyone else started posted image galleries. I'd feel kind of silly posting the same images everyone else already has, and are easily found elsewhere. However, I am thinking of adding more stuff like winamp skins and wallpapers and that sort of thing, since those would be a bit more unique to my site. Am I making any sense here? 13. What is the name of that song in one of the last episodes, it sounds like Real Folk Blues but it's different. Where can I get that? That song is a hidden track at the end of Bebop OST 3 Blue. It's the See You Space Cowboy version of Real Folk Blues. 14. Do you have sheet music or tabs for any of the Bebop music? My band wants to play the music! Unfortunately, I do not. 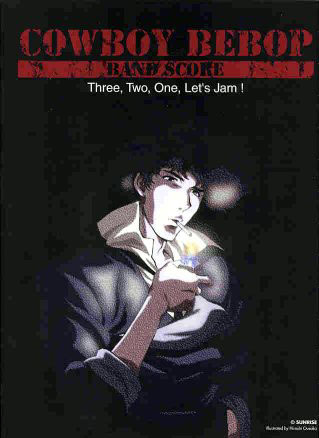 There was a Cowboy Bebop Band Score book (ISBN 4-89601-413-8) and a Piano Piece book (ISBN 4-8114-3879-5) but both books are out of print and very difficult to find. The best place to try to find this book is AnimeBooks. They have been better than most places at keeping this hot item in stock :D I don't play any musical instruments, so I never actually purchased either book, and have no idea what exactly is in it.! 15. What is the name of the song that plays during ___ scene in episode ____.